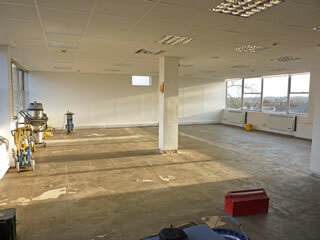 Pentland Brands Plc were carrying out a major refurbishment of one of their London offices. 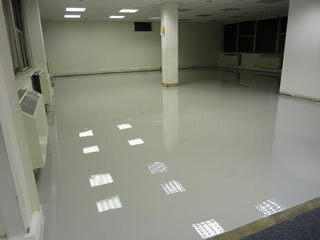 We were asked by facilities manager to provide a waterproof flooring system to the floor of an office and archive store directly above the company’s IT Department which housed the company’s main frame computers. 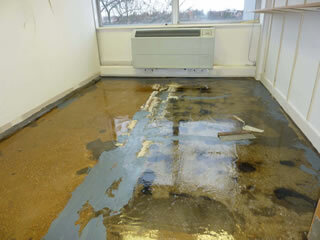 It is an old building and the floor was of beam and slab construction under an old self-smoothing cement screed. Under the screed there were many old cracks within the concrete slabs. Should have been a leak from a radiator or the floor flooded, with the floor in its present condition, the consequences to the equipment housed in the IT Department would have been catastrophic. Our resin screed was to act as a middle waterproof layer between the concrete and a new latex screed and vinyl (applied by others), which was going to be applied over our resin system. 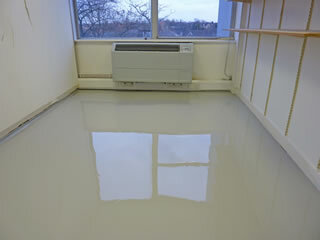 We were to prepare the surfaces for treatment by removing the old self-smoothing cement layer and apply our waterproof resin screed over the whole section of the floor above the IT Department. 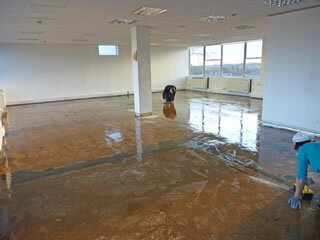 We used diamond grinders to remove the cement screed and to expose the cracks. We used a low viscosity two-pack resin primer to penetrate and strengthen the concrete and a thixotropic elastomeric paste to infill the cracks. After hardening we applied a 2.5mm screed of a solvent free self-smoothing resin flooring material to seal the whole surface. The work was carried out over a single weekend in order to avoid disturbing the staff who would normally be working in the building during the week.